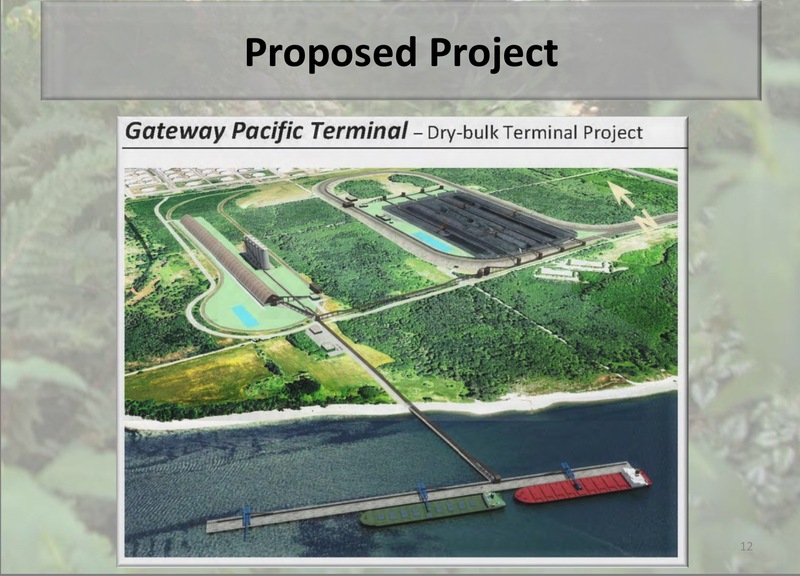 Photo of slide featuring the proposed Gateway Pacific Terminal project. Slide is from a March 20, 2012 presentation on the Environmental Review Process for the Gateway Pacific Terminal and BNSF Custer Spur Proposal, given by Whatcom County Planning and Development Services, and the Washington Department of Ecology. UPDATE: This article was updated on February 11, 2017. It was originally published on February 1, 2017. GPT applicant Pacific International Holdings/Pacific International Terminals, sent a February 7, 2017 letter to Whatcom County Planning and Development Services, withdrawing its three permit applications (two in 2011, and one in 2012) submitted for the proposed Gateway Pacific Terminal project at Cherry Point. 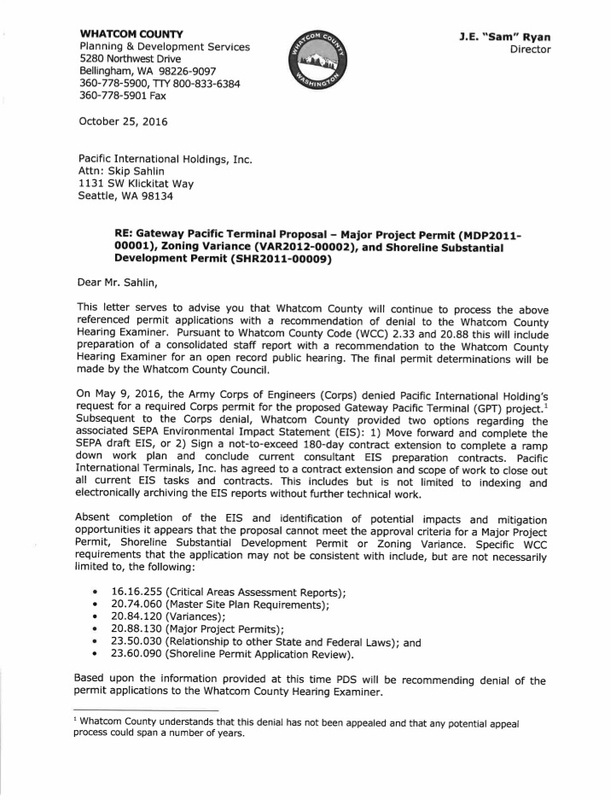 Whatcom County Planning and Development Services (PDS) sent a February 8, 2017 email response to PIH/PIT, acknowledging receipt of the company’s February 7th letter in which it notified the County that it was withdrawing its three permit applications for the proposed Gateway Pacific Terminal project. 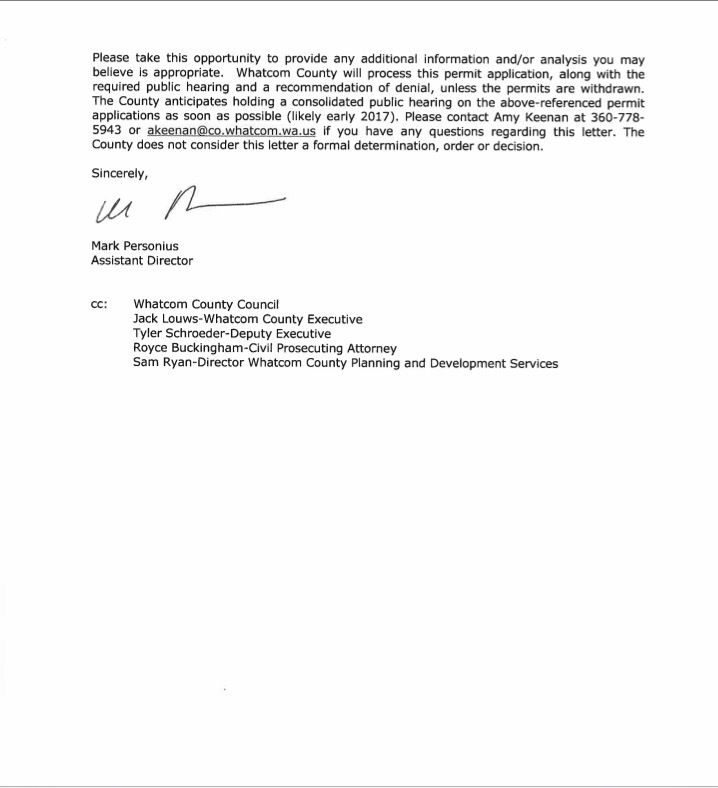 In its February 8th email, Whatcom County PDS let PIH/PIT know the County would be canceling the pre-hearing conference with the Whatcom County Hearing Examiner and notifying the public and other interested parties of the permit withdrawals. Gateway Pacific Terminal (GPT) proponent Pacific International Holdings (PIH) is still at it, trying to bluster and bully Whatcom County into doing their bidding. It seems PIH, formerly known as Pacific International Terminals (PIT), a subsidiary of SSA Marine, wants the County to politely stand by until PIH decides if and how its company would like to force through a project, the construction of which according to the U.S. Army Corps of Engineers, would violate Lummi Nation’s Usual & Accustomed treaty fishing rights. 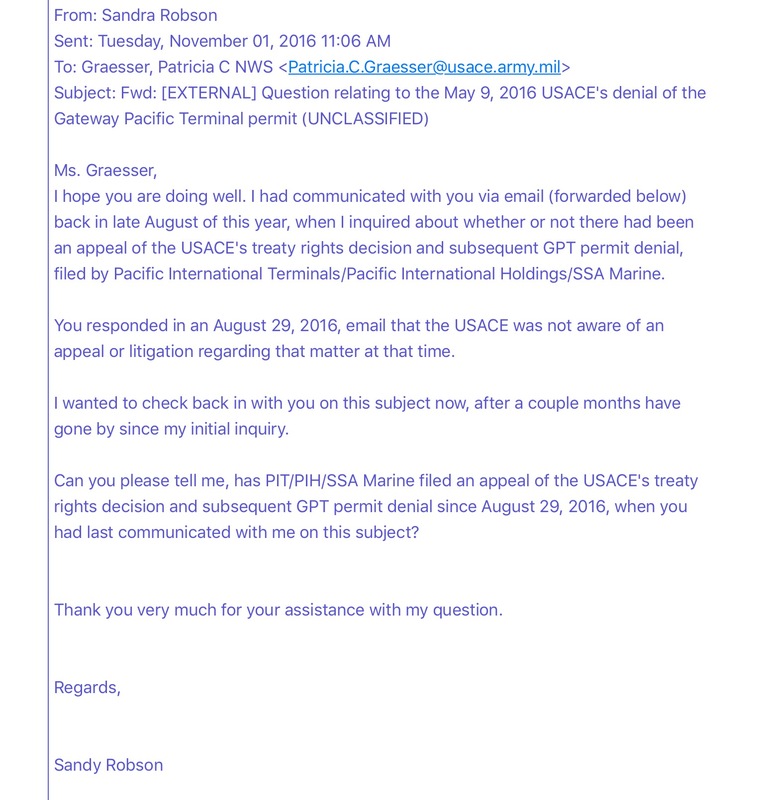 Back in October 2016, Whatcom County Planning and Development Services (PDS) Assistant Director Mark Personius, sent a letter to Skip Sahlin, Vice President at SSA Marine, the world’s largest independent, privately-held marine terminal operator. SSA Marine created its subsidiary PIT to develop the GPT project, a 48 million ton per year coal export terminal proposed at Cherry Point. Shoreline Substantial Development Permit, Major Development Permit, and Zoning Variance for applicant PIH’s proposed GPT project. Denial of these three local permits has been identified by some individuals knowledgeable in County planning procedures and statutes, to be one of the most effective actions toward ensuring that the project, as outlined in the current permit application, would not be able to linger on and potentially move forward at some later date. 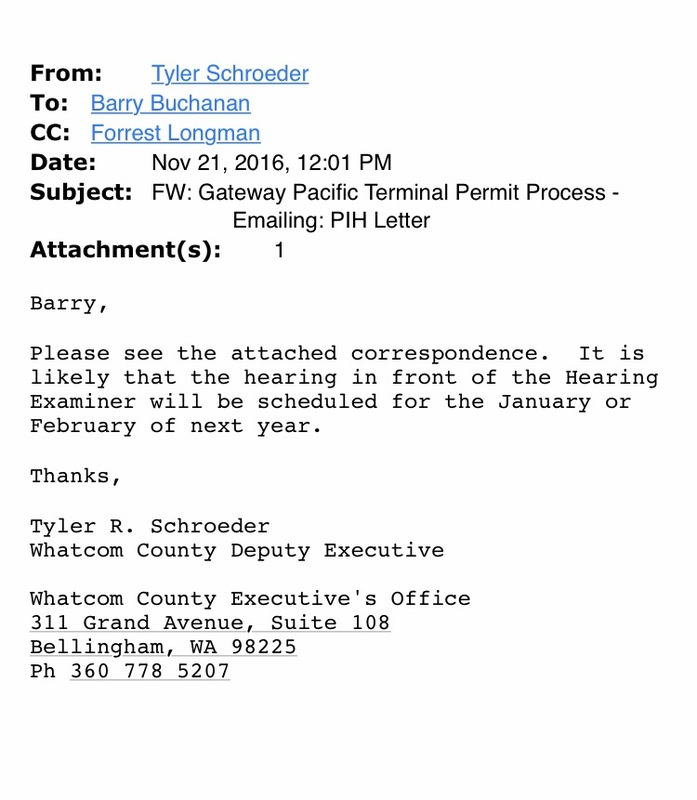 Email records obtained from Whatcom County show a November 21, 2016 email from County deputy executive Tyler Schroeder, sent to County Council Chair Barry Buchanan, in which the deputy executive said it was likely the hearing in front of the Hearing Examiner will be scheduled for January or February of 2017. 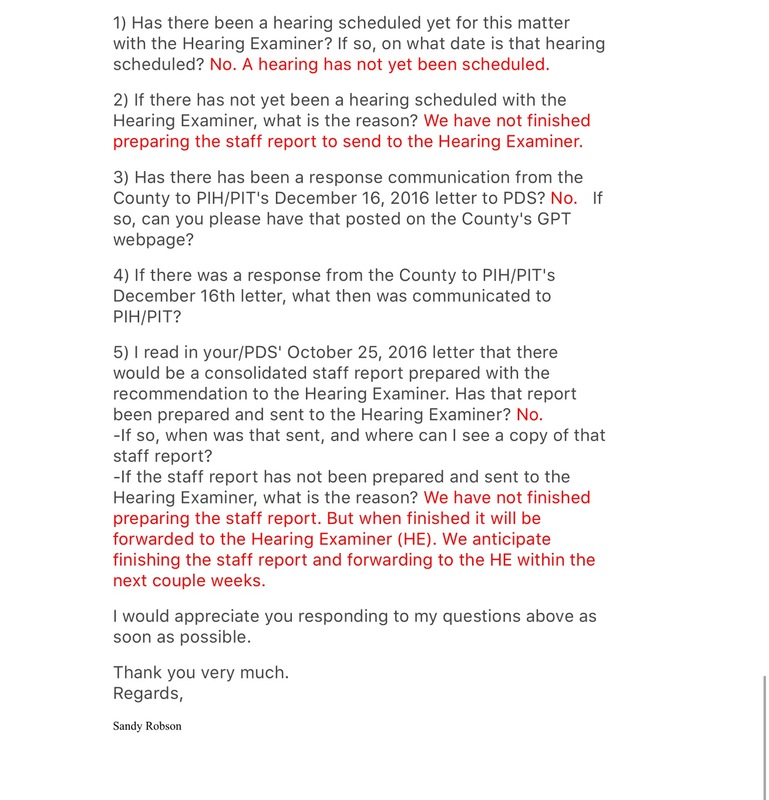 However, according to a January 24, 2017 email from PDS’s Personius, replying to this writer’s January 23rd email inquiry, the hearing has not been scheduled yet because PDS has “not finished preparing the staff report to send to the Hearing Examiner.” Personius said he anticipates PDS finishing the staff report and forwarding it to the Hearing Examiner within the next couple weeks. 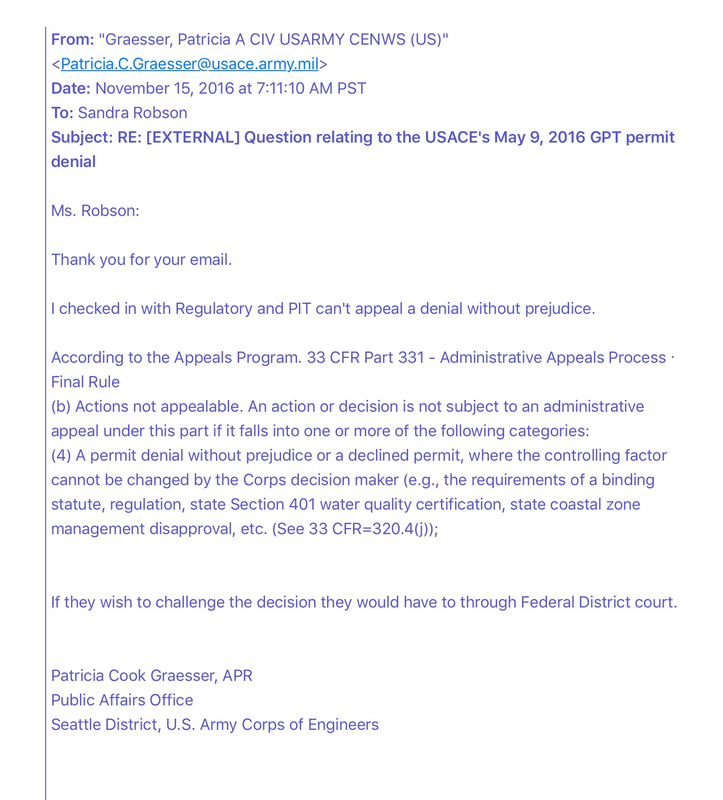 Sahlin took the opportunity in his letter to make the point that PIH continues to consider both whether to file an appeal, and the timing of that appeal of the U.S. Army Corps of Engineers’ May 9, 2016 permit denial decision for its company’s GPT project. The Corps had determined its agency cannot permit the GPT project because the potential impacts from the construction of the GPT facility would be greater than de minimis (too small or trivial to warrant legal review) to the Lummi Nation’s Usual and Accustomed treaty fishing rights, and the Lummi maintain their objections to the proposal. A few things are worth clarifying here. While Sahlin uses the word “appeal,” in the case of a permit denial without prejudice, that decision by the Corps is not subject to an administrative appeal. However, the applicant, if it chooses, can challenge the permit denial decision through Federal District court. However, Sahlin failed to make the important distinction that if PIH were to submit a project alternative, that would entail PIH having to submit an entirely new application, which would then not carry the vesting rights associated with the company’s original 2012 permit application for the GPT project. In general, Washington state’s vested rights doctrine requires local jurisdictions to consider land use applications using the statutes and ordinances in place at the time a completed application is submitted. Until a property owner acquires a vested right to complete a project, the property owner can be subject to local governments’ newly adopted regulations. 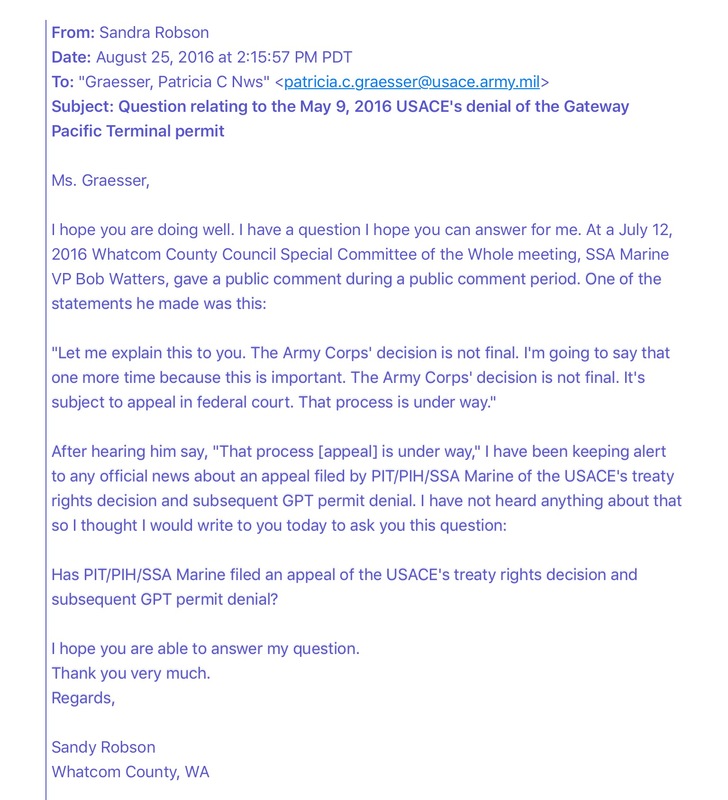 Back in July 2016, Ms. Graesser sent a July 18 email responding to this writer’s email inquiry regarding statements made by SSA Marine senior vice president Bob Watters, at a July 12, 2016, Whatcom County Council Special Committee of the Whole meeting. Watters’ testimony at the July committee meeting was related to the Cherry Point Amendments proposed to Whatcom County’s 2016 Comprehensive Plan Update, which was going on at that time. The Comprehensive Plan provides a detailed guide to growth planning for the County. The amendments were proposed by Council member Carl Weimer, to the Land Use chapter pertaining to the Cherry Point Urban Growth Area (UGA) section in the Comprehensive Plan. During that Special Committee of the Whole meeting, the Council went into an Executive Session with its legal counsel Deputy Prosecutor Karen Frakes. While the public is not privy to what happens during Executive Sessions, it appears that the Council may have been advised by Frakes to sever the Cherry Point Amendments from the 2016 Comprehensive Plan Update placing those into a separate process. After that statement by Buchanan, a motion was made and the County Council voted to separate out the Cherry Point Amendments from the County’s 2016 Comprehensive Plan’s normal 10-year review cycle — and those proposed amendments were sent to the County Planning Commission to be docketed for review. That review by the Planning Commission began in October 2016, and finished on January 12, 2017, when the commissioners voted on their final recommendation, forwarding that to the County Council for its deliberation. Weimer had proposed the Cherry Point Amendments in late June/early July 2016, as he had waited to propose those until after the Washington Department of Natural Resources, on June 6, 2016, denied the aquatic land lease application needed by PIH/PIT for its dock included in the GPT project proposal. Some of the language in those proposed amendments to the Comprehensive Plan guiding land use and zoning for the County could impact a future application that PIH/PIT might decide to submit. 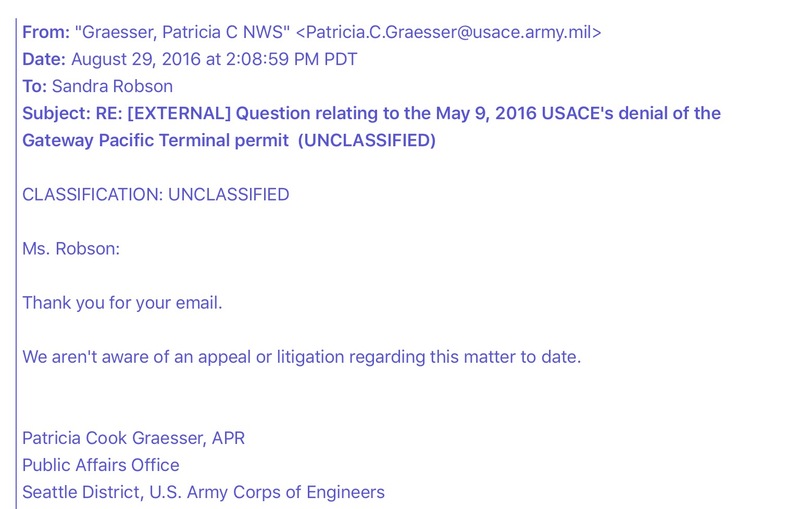 Two months later, on November 1, 2016, this writer sent a follow up email to Ms. Graesser, asking if she was aware of any litigation filed regarding the Corps’ May 9 permit denial, since her previous communication in late August. She answered that same day via email, that no challenge/appeal had been filed. Even though SSA Marine Sr. VP Bob Watters, told County Council members, and the public attending the July 12, 2016 Council Special Committee of the Whole meeting that the process to appeal, in federal court, the Corps’ May 9, 2016, GPT permit denial decision was already “under way,” according to Sahlin’s December 16, 2016 letter to PDS, the company is still “considering the timing of when, or whether to file an appeal.” So it does not appear that an appeal or challenge was, in fact, underway as Watters proclaimed to the Council and public in July. Both Watters and Sahlin continue to use the idea that their corporation might file a legal challenge regarding the Corps’ permit denial, in apparent attempts to influence County officials’ decisions regarding the local permit process for the GPT project, as well as the County’s land use policies pertaining to the Cherry Point UGA in the Comprehensive Plan Update. It is vital that County officials disregard the bluster and misleading claims presented by a corporation advocating for a project that has already been denied the required permits by the Corps, and has been denied the required aquatic lands lease by the Washington State Department of Natural Resources. Whatcom County citizens need to let PDS Director Sam Ryan, PDS Assistant Director Mark Personius, and County Executive Jack Louws know that it is not in the public’s interest for the County to allow the local permitting process for the GPT project to drag on any longer. The staff report that PDS has not yet completed needs to be made a priority so it can be sent to the Hearing Examiner. Once that report is received, then a public hearing in front of the Hearing Examiner can be scheduled.